Excellent service! Speedy payment. Sent it my special delivery Friday afternoon, and received an email morning morning telling me how much money would be in my account 3 business days later. I converted my money as such a better rate than I would have in a store etc. Well recommended! Excellent fast service kept informed at each step, very simple to use. Quick and easy service, very good rate, even if you deduct the postage you still get more than the high streets can offer! Excellent service. I sent currency by special delivery as requested. It was delivered the following day at 0735. An email followed from Exchange to confirm receipt, and a transfer to my nominated account was made two days later. Definately to be recommended. Only changed a small amount of left over euros back, but really good exchange rate and a very fast service. Would use again without doubt. Posted Tuesday, money Transferred on Wednesday! sold 3 different currencies to thomas exchange, paid out within three days excellent communication and service highly recommended. would have no hesitation in using again thank you to paul nelson. Excellent service. The system was quick, easy and efficient. I repeated last weeks exchange, I sent 1000 Euro on Friday & I received £ 844 today in my bank. Fee was about £5 against mkt rate, slightly more than expected. I will not be using any high street Bank, PO or travel agent in the future. JC. Sent form and money on a Tuesday, money was in my bank account by Friday and received an email acknowledgement that money received. Can't complain and would recommend service to anybody. Thank you. We sold back unused currency. It was an excellent service, they did what they said they would do - on time, amount that was agreed. Quick and simple to use. Best of all the exchange rate was considerable better than high street (difference of £43). Would recommend. 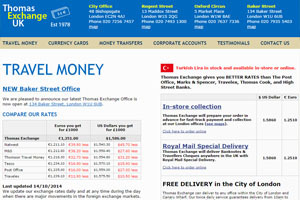 Had to send the money from the US which was worrying but Thomas Exchange provided an A+ service. This was so straight forward and went so smoothly I have to wonder why I've never done this before. I sent off my currency on Monday, received an email confirming receipt of it the next morning & telling me the rate I would receive (which was better than that quoted) and that I would receive payment within 72 hours. I actually received payment in 48hrs! I will never use a high street foreign exchange ever again. Please have no qualms about using this merchant, everything is done exactly as promised. Easy to use website and rate offered far better than the high street. Funds transferred the following day. Would recommend and use again. First rate company . I have dealt with other companies on this site and I felt they always hedged their bets on the most favourable rate that benefitted them, not this company, I actually received more than anticipated because the rate improved in my favour which they passed on to me. I had 635 euros left over and wanted them changed back to sterling. I got a very good rate and sent the euros in the evening post. I got an email at 7am the next morning to say they had received the money and paid it into my account. VERY EFFICIENT SERVICE. Excellent buy-back rate, very efficient service and good communication. Excellent service, emailed what was happening throughout and money transferred in good time. Rate paid was slightly higher than the indicative rate - definitely trustworthy. Good rate of exchange, easy to follow the instructions provided, acknowledgement and confirmation communication was excellent. Thomas Exchange, first established in 1978 through its strong team of dealers and cashiers, is dedicated to a personal service designed to meet the needs of business and leisure travellers. They offer a level of service which can be relied upon with confidence.